Ada and Darcy: Some gorgeous fabrics to enjoy! Some gorgeous fabrics to enjoy! Oh I just adore Amy Butler fabrics. So much prettiness! Such beautiful use of colour. Just what i need for a Thursday! I would love to know, what grabs you in a fabric? Lovely fabrics - those ones on the ottoman remind me of Cath Kidston, whose Mono Rose is one of my top favourites for restful beauty. I love so many different styles, it's hard to pin any one down. Love your pictures. fantastic. I love the colour palette in the second picture. very inspiring! Beautiful fabrics. I like it all..
Oh I do love her fabrics. They remind me of beautiful wrapping paper. My taste tends to vary in fabrics. Too many choices!! oh yes, her fabrics are sooo pretty! loveliness! the deep chocolate colored desk is what catches my eye! Gorgeous! 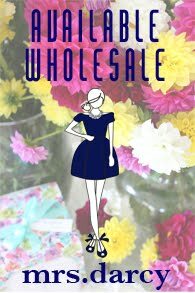 I am having a giveaway on my blog, come check it out! Those colors are so lovely. I love how they can be sophisticated and really fun at the same time. what colours! so many fabrics grab me, but i do love the vibrant patterns of asia especially. Amy Butler always has the prettiest most vibrant fabric!! I want the round pillows with tassels. Gorgeous! 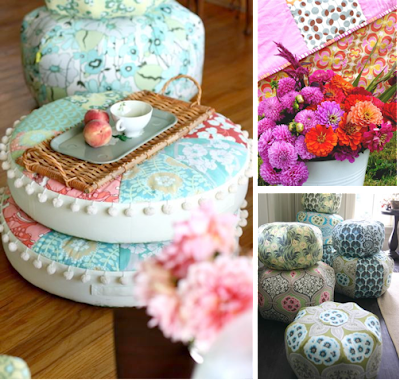 I love her style and the ottomans are fabulous! So pretty and so bright! Love 'em. I love Amy Butler! All of her fabrics are spectacular. Please, stop by when you have a chance. I have a design dilema and I need your help. Love Amy's fabrics -- and her new bedding line! I love texture and detail in a fabric... these photos are gorgeous! Needing some inspiration for my family room once my kitchen is finished. These are great! I think the colours, patterns and textures grab me in fabrics. I adore the Amy Butler line. Gorgeous! I am an absolute sucker for vintage florals. she is also one of my very favorite designers!! I didn't know how much I loved textiles until I bought her book. 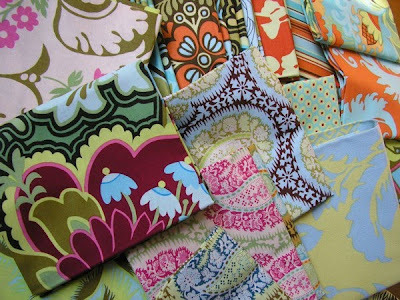 I can't say what it is about a fabric - the color, the pattern, vintage shapes or mod ones...I don't know that I can put it in words. great question. I´ve just discovered your blog in this night without husband having some time to search in the web. Beautiful one. I love Amy Butler, too! I use her fabrics a lot for sewing projects, and I once made a large room screen out of old screen doors that were missing their screens. In place of the screens I strecthed Amy Butler fabrics. It looked pretty fabulous! Her colorsa re just divine.